Impoverished Bangladesh will strictly enforce a new ban on begging that aims to fully eliminate it within five years, an official said. Mir Aslam, a spokesman for the Ministry of Social Welfare, said that they were now preparing enforcement plans following a law passed in Parliament earlier this week. He said detailed guidelines are expected to be in place within a month. According to the new law, anyone caught begging in public places will face a maximum three months in jail. 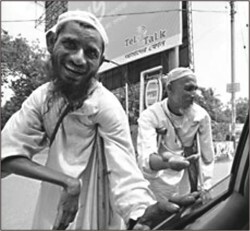 Begging on streets of the nation's capital, Dhaka, is rampant although its economy has grown by about six per cent a year in recent years. Finance Minister A.M.A. Muhith said earlier that the government wants to eliminate begging from the country within five years. The World Bank said in November that the percentage of Bangladeshi people living on less than $1 a day has been reduced to 40 per cent from 49 per cent in 2000.